No one likes a dirty shower, but cleaning it isn't always fun. Bleach is one of the best substances to use to clean things in the bathroom. While you can purchase bathroom cleaners that contain bleach, it is just as easy to create your own cleaner using bleach. Because bleach can remove mold and mildew, it is especially effective when cleaning a shower that stays wet all of the time. 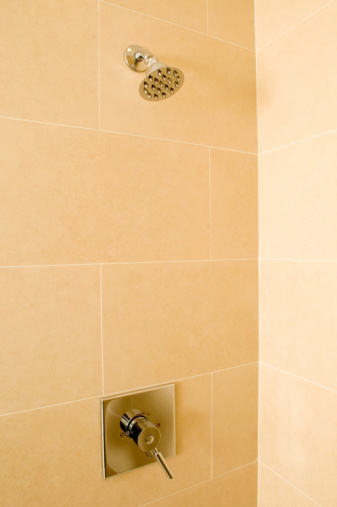 Use bleach to clean your shower and rid it of mold and mildew. Open the bathroom window to allow for ventilation. If your bathroom does not have a window, keep the door open. Remove everything from the shower, such as shampoo, conditioner, body wash, loofahs, a mat and anything else that might be there. Mix together equal parts bleach and water and place it inside a spray bottle. Shake the bottle to combine the two substances. Put on rubber gloves. If your bathroom does not have good ventilation, put a mask on as well so that you don't inhale the fumes from the bleach. Spray the liquid onto the shower walls, floor and any other surfaces and rub them with a soft cloth. If some areas have more mold or mildew than others, such as the grout between tiles, scrub them with a toothbrush. Rinse the bleach cleaning liquid off the walls using the showerhead or a clean, wet cloth when the shower is satisfactorily cleaned. Megan Smith started writing professionally in 2003. She has written for newspapers such as the "Anniston Star" and the "Anderson Independent-Mail." Smith has a Bachelor of Arts degree in journalism and a Master of Arts degree in communications from the University of Alabama.